Installation, that's as easy as 1, 2, 3 Intelligent i-CS lens technology in AXIS Q1615 Mk II facilitates fast and easy installation and adjustment. The camera and the lens exchange information. So once your installer has activated the relevant features, setting up barrel distortion correction and electronic image stabilization is smooth and easy. Zoom can be set remotely - and then the camera automatically sets the focus. All in all, you'll save both time and money. One camera - three scenes For each profile, the camera automatically optimizes exposure time, white balance, aperture, sharpness, contrast and noise for each camera in your surveillance solution to suit specific use scenarios. For instance, you can set up the Traffic Overview profile with the specific height of the camera, the average speed of passing vehicles and the distance to the road and vehicles. The result is always-great image quality and cost-effective installation. Amazingly fast With up to 100/120 fps in HDTV 720p and up to 50/60 fps in HDTV 1080p, AXIS Q1615 Mk II captures sharp images of fast-moving objects and people. So you can capture clear, detailed footage of people and vehicles on the move, or products and components on your production line. 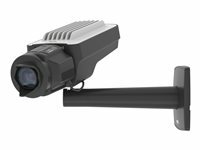 Excellent image quality - low bandwidth AXIS Q1615 Mk II provides images, that are optimized for forensic purposes regardless of lighting conditions. It has improved Lightfinder technology for high-quality images even when they're recorded in darkness. WDR - Forensic Capture ensures excellent detail when there are both bright and darker areas in a scene. The enhancement of Axis' Zipstream technology significantly reduces bandwidth and storage requirements, while preserving high-quality images. And the dynamic frame rate instantly adapts to any changes in the scene. An ultra-fast camera, that can take a hit With up to 100/120 fps in HDTV 720p and up to 50/60 fps in HDTV 1080p, AXIS Q1615-E Mk II captures sharp images of fast-moving objects and people. With a robust aluminum casing, AXIS Q1615-E Mk II can withstand temperatures as low as -40°C and as high as 60°C (-40°F to 122°F). Arctic temperature control ensures safe start-up at temperatures down to -40°C, even after a power failure. And with IP66, NEMA 4X and IK10 ratings, you can be sure, that the camera housing is resistant to both harsh weather conditions and impacts. Installation, that's as easy as 1, 2, 3 Improved, intelligent i-CS lens technology in AXIS Q1615-E Mk II facilitates fast and easy installation and adjustment. The camera and the lens exchange information. So once your installer has activated the relevant features, setting up barrel distortion correction and electronic image stabilization is smooth and easy. Zoom can be set remotely - and then the camera automatically sets the focus. All in all, you'll save both time and money. Excellent image quality - low bandwidth With improved Lightfinder, AXIS Q1615-E Mk II provides high-quality images even when they're recorded in darkness. WDR - Forensic Capture ensures excellent detail, when there are both bright and darker areas in a scene. The enhancement of Axis' Zipstream technology significantly reduces bandwidth and storage requirements, while preserving high-quality images. And the dynamic frame rate instantly adapts to any changes in the scene. Capture more light - always High resolution. Full frame rate. Unparalleled light sensitivity. That's the difference between an image that's sharp and one that's razor sharp in any light. Simply put, AXIS Q1645 is a camera that's second to none. 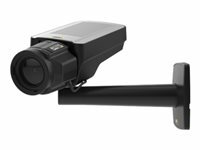 That's one smart camera AXIS Q1645 is chockful of intelligent features that facilitate smart decision-making, enhanced security, first-class image usability, and fast, easy installation. It comes pre-installed with AXIS Motion Guard, AXIS Fence Guard and AXIS Loitering Guard analytics for proactive surveillance. And an orientation aid enables dynamic text overlays with street names and a compass symbol for quick orientation if you're using multiple monitors. In addition, intelligent i-CS lens technology facilitates fast and easy installation and adjustment. Plus zoom can be set remotely - and then the camera automatically sets the focus. Both of which help minimize time and money spent on installation. One camera, three scenes With AXIS Q1645, you can choose between three scene profiles. For each profile, the camera automatically optimizes exposure time, white balance, aperture, sharpness, contrast and noise for every camera in your surveillance solution to suit specific use scenarios. The result is always great image quality and cost-effective installation. Razor sharp Full resolution. Full frame rate. Superior light sensitivity. That's the difference between an image that's sharp and one that's razor sharp. Simply put, AXIS Q1647 is a camera that's second to none. 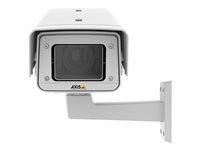 That's one smart camera AXIS Q1647 is chockful of intelligent features that facilitate smart decision-making, enhanced security, first-class image usability, and fast, easy installation. It comes pre-installed with AXIS Motion Guard, AXIS Fence Guard and AXIS Loitering Guard analytics for proactive surveillance and saved resources. An orientation aid enables dynamic text overlays with street names and a compass symbol for quick orientation if you're using multiple monitors. In addition, intelligent i-CS lens technology facilitates fast and easy installation and adjustment. Plus zoom can be set remotely - and then the camera automatically sets the focus. Both of which help minimize time and money spent on installation. One camera, three scenes With AXIS Q1647, you can choose between three scene profiles. For each profile, the camera automatically optimizes exposure time, white balance, aperture, sharpness, contrast and noise for every camera in your surveillance solution to suit specific use scenarios. The result is always-great image quality and cost-effective installation. Sharp, razor sharp Full resolution. Full frame rate. Superior light sensitivity. That's the difference between an image that's sharp and one that's razor sharp. Simply put, AXIS Q1647-LE is a camera that's second to none. You get 5 MP at up to 30 fps, electronic image stabilization (EIS) and Axis Forensic WDR which ensures a perfect balance in scenes with strong variations in light. And the 1/2" sensor and Axis Lightfinder enable outstanding image usability in poor light. Rough and ready With a robust aluminum casing, AXIS Q1647-LE can handle start-up temperatures as low as -40 °C and as high as 60 °C (-40 °F to 140 °F). It features powerful IR for effective surveillance in pitch darkness. And with IP66, IP67, NEMA 4X and IK10 ratings, you can be sure that the camera housing is resistant to both harsh weather conditions and impact. It even sports defog functionality that automatically filters out fog to provide clearer video. 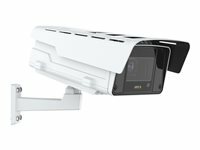 That's one smart camera AXIS Q1647-LE is chockfull of intelligent features that facilitate smart decision making, enhanced security, first-class image usability, and fast, easy installation. It comes pre-installed with AXIS Motion Guard, AXIS Fence Guard and AXIS Loitering Guard analytics for proactive surveillance and saved resources. An orientation aid enables dynamic overlays with street names and a compass symbol for quick orientation if you're using multiple monitors. And you can choose between three scene profiles, which automatically optimize exposure time, white balance, aperture, sharpness, contrast and noise for every camera in your surveillance solution to suit specific use scenarios. In addition, intelligent i-CS lens technology facilitates fast and easy installation and adjustment, which helps minimize time and money spent on installation.